Mars has gone to Hell. Literally. An evil corporation has tapped the unlimited powers of the underworld with predictable results. 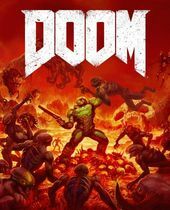 Demonic forces have overrun the red planet and it’s up to a lone space marine to stop them in id Software’s bloody, brilliant reimagining of DOOM – the granddaddy of the modern first-person shooter. 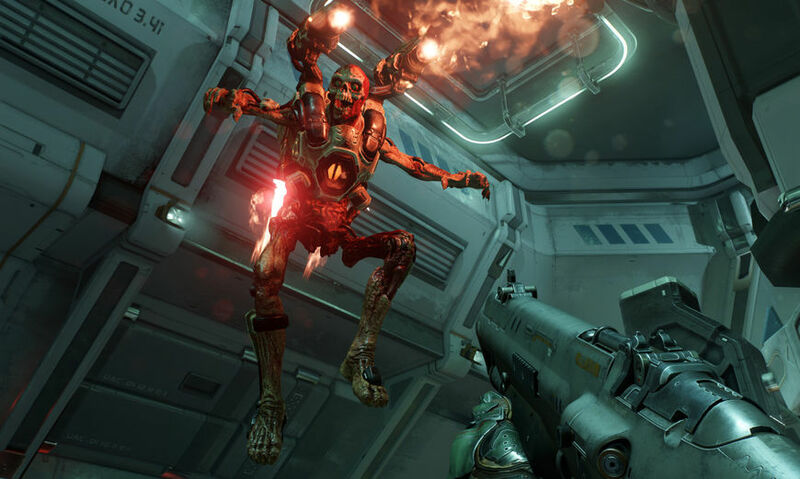 Channelling the heavy metal album covers and pulpy sci-fi that inspired the original game, 2016’s DOOM is finely tuned to capture the essence of what made those earlier games such a blast to play. 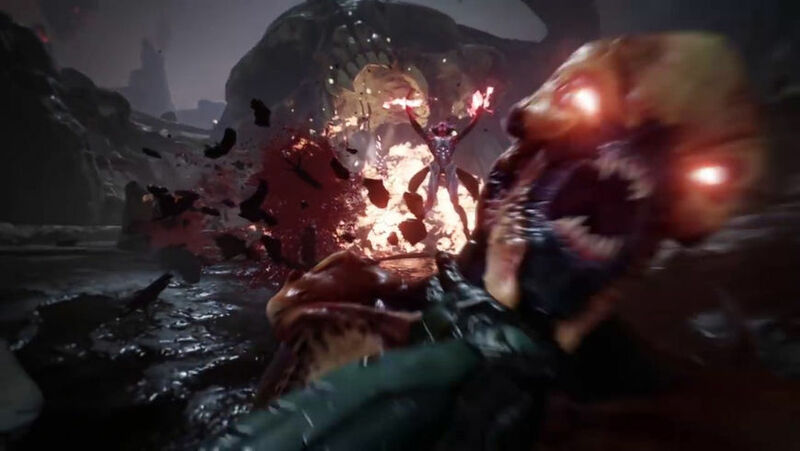 According to Creative Director Hugo Martin, DOOM will have players feeling like “Bruce Lee with a shotgun on a skateboard” – an apt description that must be played to be believed. It’s all refreshingly retro, an ultraviolent power fantasy with a dash of Verhoevian satire for good measure. 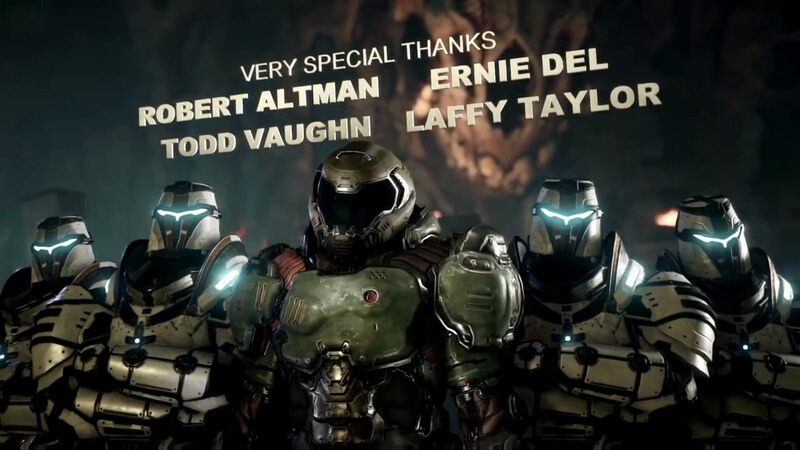 DOOM’s end credits are the perfect coda for that kind of gameplay experience. 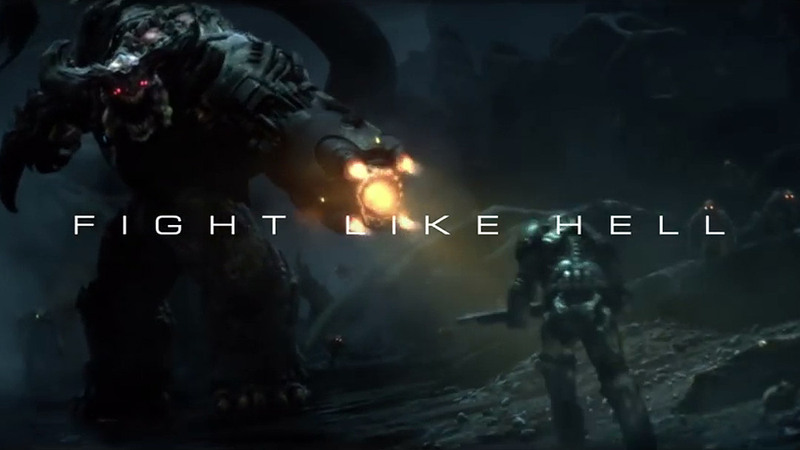 A four-minute reprise of the player’s gib-filled journey, the title sequence is a hard rockin’, shotgun-blasting, demon-dismembering battle across Mars and into Hell itself. It’s rare for game developers to get their due in anything but a lengthy end crawl (title sequences remain a rarity in video games), but here each department is given their due with a thematically appropriate tableau; a terrifying hellscape for the environment artists, a map room for the mission designers, an arrayed arsenal for the weapon modelers, and so on. It’s precisely what a good end title sequence should do: bookend the experience in an entertaining way while celebrating the people who made it all possible. 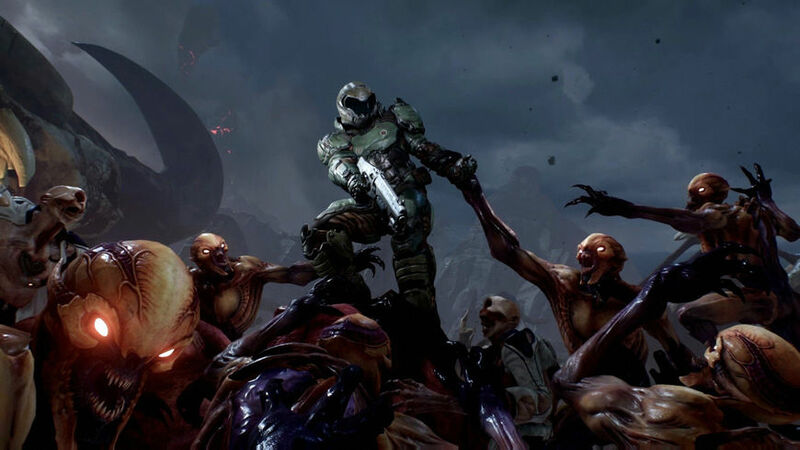 Rip and tear, Doomguy! 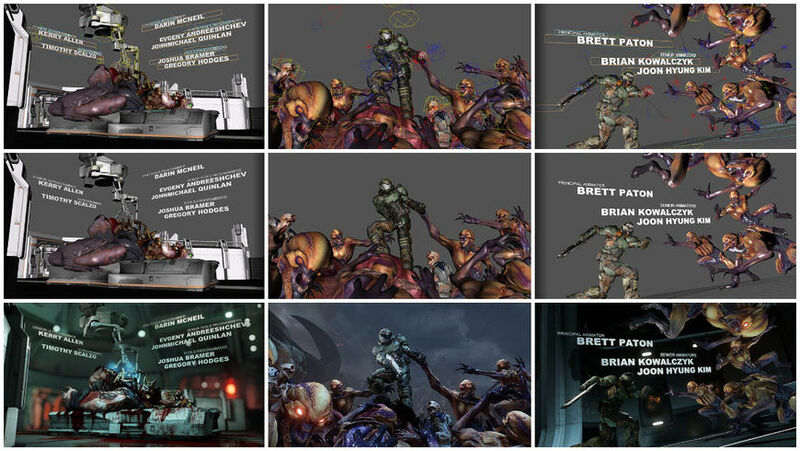 A discussion with Principal Animator BRETT PATON of id Software. 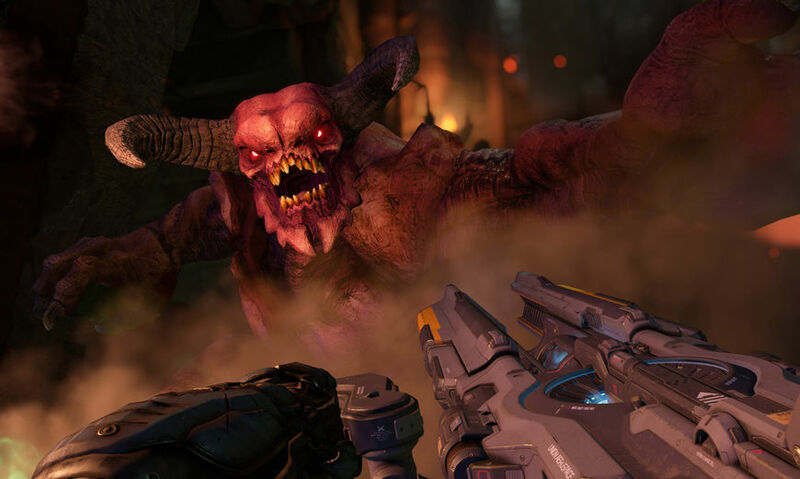 Could you give us a little background on yourself and how you came to be at id Software? Brett: I started in visual effects and animation at Café FX (then Computer Café) back in 1998 as a 3D generalist. We did lots of commercial and film work there ranging from things like Armageddon and Sin City to HBO and NBC bumpers and promos. I had a design background from school and while I do enjoy visual, motion, and graphic design, my passion was really in character and CG animation. Back then there weren’t a lot of options for how to become a CG animator, so I just learned as much as I could in school, received a BFA in design, and then focused on animation once I got my foot in the door. Brett: Eventually, I got onto some CG films as an animator working for Sony Imageworks, Rhythm & Hues, and DNA Productions on films like Open Season, Surf’s Up, and Jimmy Neutron. I really enjoyed film and VFX production but I’ve been a gamer pretty much my whole life and knew that at some point I’d want to get into the games industry. I spent a year modding different first person shooters for fun and enjoyed it so much that I decided to start applying for game animator positions in the industry. When id Software was looking for animators back in 2008, I thought applying was a no-brainer since I considered it to be one of the top places to work in the industry. 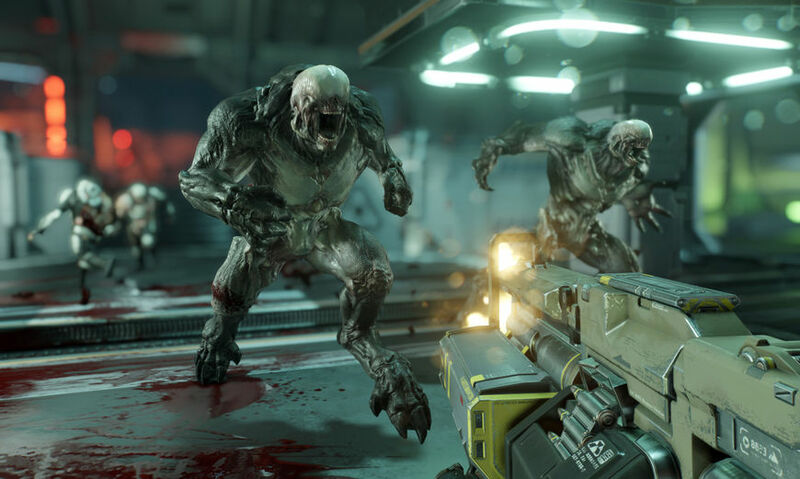 So what does an animator on a AAA video game like DOOM do? Brett: It mostly involves animating characters and the first-person player. However, we are a small animation team and we all do a lot more than just animate. Since I have a good amount of experience with different productions and techniques, I do a lot of rigging for things like weapons and props and occasionally simple characters. A big part of game animation, as opposed to film, is actually making that animation work in-game in real-time. Modding really gave me a strong grasp on that side. Brett: And since I’m also fairly technical, I’ve written tools to help get certain types of animations into the game – something that really came in handy when doing the end credit sequence. My film experience was also directly applicable to this, not just conceptually but the technical execution as well. 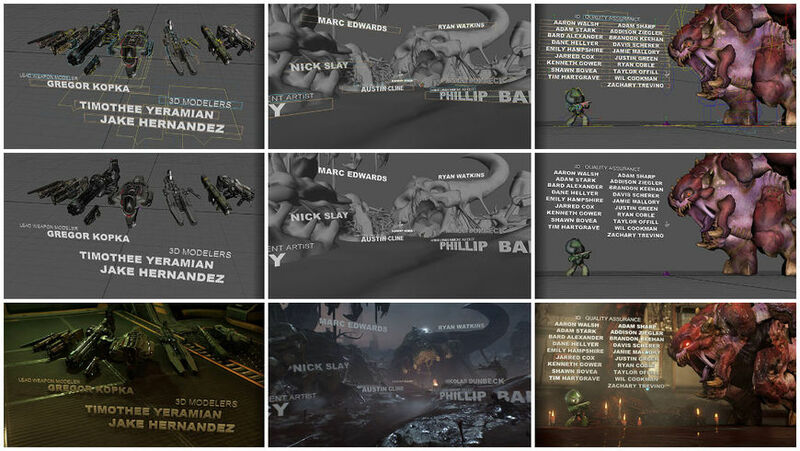 While the credits do play in real-time, I approached creating them like you would any short film or animated CG sequence. What’s your personal history with the DOOM series? When was your first exposure to the original games and what were your initial impressions of it? Shareware is a type of software which is initially provided free of charge to users, who are allowed and encouraged to make and share copies of the program. 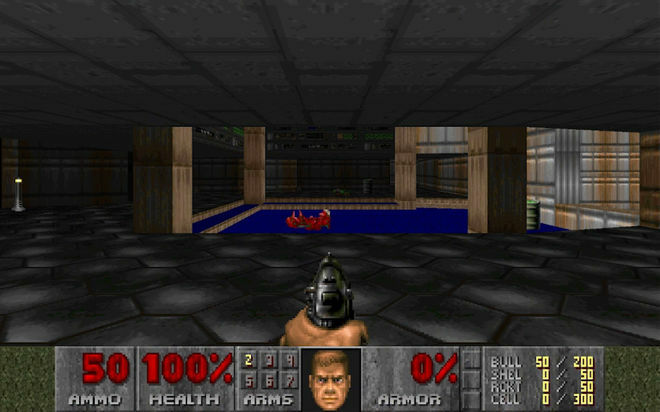 Brett: I remember seeing DOOM in a computer gaming magazine the summer before I went to college. It looked so good, I couldn’t believe it was coming from a shareware company. I believe it came out the day before my birthday in 1993 and I tried downloading it from my modem in my dorm room. Too slow. So I went to the library with three floppy disks and downloaded it on the T1 speed computers. I remember thinking I was going to get in trouble for connecting to a BBS (Bulletin Board System), but it downloaded quickly. I went back to my dorm room and installed it in MS-DOS, fired it up, and could not believe how good it looked. DOOM (1993) level E1M1 playthrough. 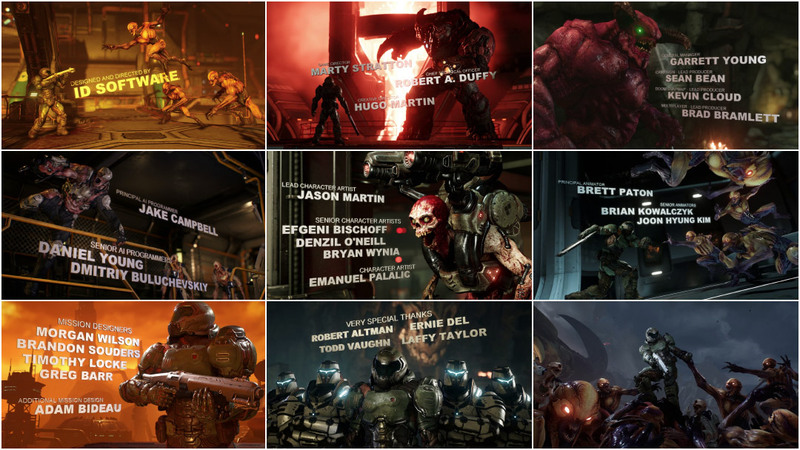 The music "At Doom's Gate" provided the basis for composer Mick Gordon's track of the same name used in the DOOM (2016) end credits. 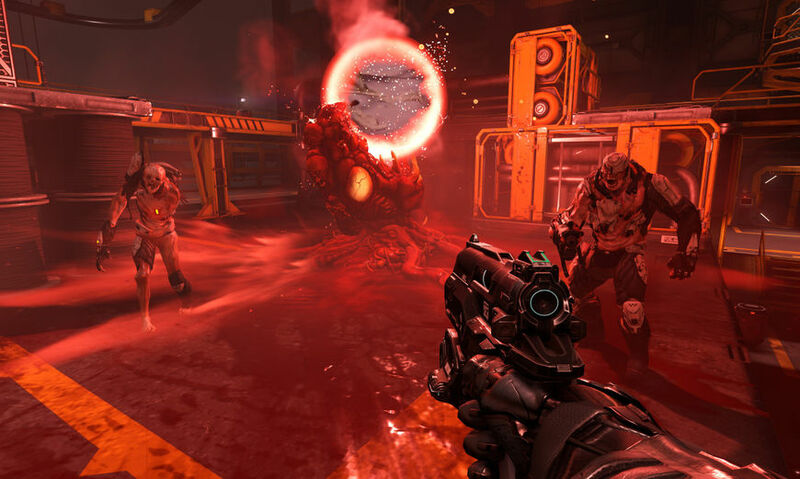 Brett: Years later, the day DOOM 3 came out, I was playing the first level and shortly after the moment all hell breaks loose, my screen went pink and I could smell smoking electric parts. DOOM 3 had literally melted my graphics card. Turns out I’d had my case fan going the wrong way for years, but I used that as an excuse to justify upgrading my graphics card to see DOOM 3 in all its visual glory. So let’s talk about 2016’s DOOM. Unlike film and television, video game title sequences are still a bit of a rare thing. At what point in the game’s development did the team start thinking about an end title sequence? Brett: I’ve always thought about this in a vague sense, because I loved when I saw cool title sequences starting to crop up in movies during the early to mid-90s. Right before E3 2015, where we’d show the game to the world for the first time, I worked on a video to share with the team. It was kind of a rah-rah video to get people pumped for E3 and I used demo footage cut together with this great football speech I found online. I was so excited to make this video I came in during the weekend to make sure I could do it. When I was all done, it gave me goosebumps to see it. I felt that it really showed the power that it takes for a team – from QA to the most sophisticated programmers – to make a game like this. DOOM's heavy metal main title reveal was planned much earlier in the game's development. Brett: Marty Stratton, the Game Director and Executive Producer, liked the video so much that he asked me if I had any ideas for a credit sequence and to start thinking about it. This was about a year from the ship date and I think I said something like, “It’s never too early to be thinking about stuff like that.” I started thinking of some really cool fully animated sequences on and off, but I always kind of felt like there wouldn’t be time to see them through. We went into heavy production in the months following E3 2015 and the idea of a credit sequence pretty much left my mind. As much as I had always wanted to do something cool like this I didn’t begin thinking about it again until just months before the game was supposed to ship. What was the original concept for the end titles and how did you develop it? Brett: When we were done with animation production on the game, I was playtesting it every night and taking screenshots of all the beautiful artwork the team had made. I would send out a few screenshots every night for everyone to see because it’s easy to get caught up in meeting deadlines and not realize how good things are looking. After looking at it for years you really don’t see giant leaps that often. It’s more like watching a child grow, you never notice how much they’ve grown on a day-to-day basis until you look back or stop and really take it in. Anyway, I was listening to music one night and started to think about doing another team video when I finished going through the entire game with just screenshots, no real motion. This got me thinking about the credits again, which I had previously put out of my mind. For the next two days I mulled over whether there would be enough time to do anything cool for the credits. Most of the ideas I had in the past would be way too ambitious. However, I decided to put together a few test shots in the engine with 3D text, characters and environments to see how fast I could do a shot and what it could potentially look like. I just wanted to rough something in, but the idea was to come out of the player’s point of view and show the experience from a more cinematic perspective. Sort of show the player a history of what they did in the game. 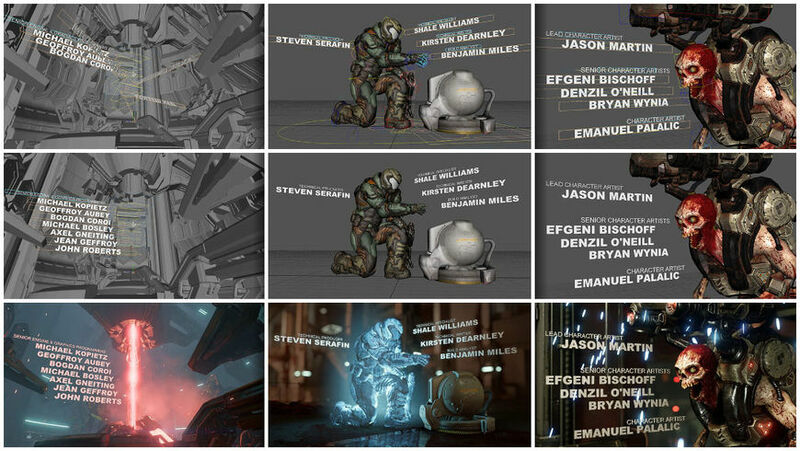 Brett: I started posing the Doom Marine in action scenes and then using the camera to give the illusion of motion. I spent the next three days putting together a variety of test shots using “FirstName” “LastName” and “Employee Title” “Department” as placeholders. I was trying to create scenes that would fit with particular disciplines. So the other theme along with seeing yourself as the player, was putting names that fit with the scene they were in. I used that great music Mick Gordon had done for the main title and cut eight test shots together for Marty and the team to see. The results were really positive and Marty decided to let me make the end credits in this fashion. It was a little scary because I knew it would be a lot of work both coming up with enough scenes as well as technically coming up with a system where I could easily generate and change 3D text. When dealing with that many names, there are bound to be mistakes. However, I thought, when would I get the chance to do something like this again? So I dove in for the next 35 days in a row. Honestly, this was done as much for the players as it was for the team. It was like a dual reward for both. What came next? Did you storyboard or create an animatic for the full sequence? 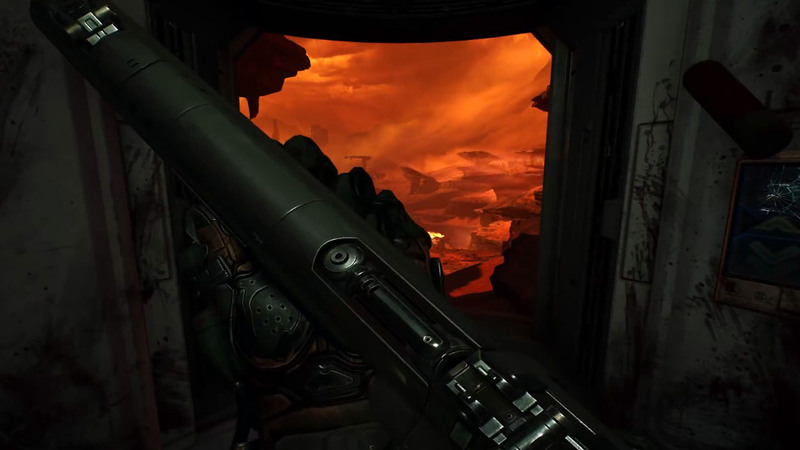 A playblast is a low-resolution crude render of computer-generated imagery used in CG production as a check for character and prop positioning and lighting placement. Brett: Definitely. Once it was decided to commit to this, the first thing I did was create some Maya scripts to generate names and titles based on the credits list. Then I started to create scenes in Maya only – textured openGL – with the correct names and placement, as well as write down ideas for future scenes or who could be in them. As I created a new shot, I would name it, for instance, ec666_minidoom, is the name of the QA shot, render out a playblast for a version of it and cut it together in Premiere. The whole thing was done in openGL first, sometimes without any idea where they might appear in the game. While it wasn’t a traditional storyboard or layout animatic, it served the same purpose – moving shots and names around, editing music tracks, etc. Since most of the shots didn’t require much animation save for the camera and titles, it was faster to just do them and adjust. Brett: From there I would export everything to the game engine which was a lot of files per object per shot, plus the camera motion. It’s a lot to track so being organized was very important. Even with some tools I made, stuff usually has some kind of issue in-game. Some shots were designed with the environment in mind but others I just kind of had to find a nice spot for. The initial test shots looked okay, but rarely did the characters look good in the environment lighting alone. I’d go in and try to put a few rim or key lights in to enhance the characters. In a full CG scene you could just mask out things and colour balance or do things in comp, render layers, etc., but because this all had to work in real-time, few of those tricks could apply. The text itself could be particularly burdensome as it tended to get lost without direct lights of its own. Tiago Sousa added some nice depth of field code to the game which came in really handy for these shots because it let the text stick out more and be readable against noisy backgrounds. Plus it just looks cool. Occasionally I would have to adjust some of the environment lights in the scene or change the scripting like in the UI shot to achieve what I was after. Every department gets a nice “curtain call” moment in the sequence. Did the respective teams have any input on what these moments would entail? Brett: The actual animators’ section which was animated by Brian Kowalczyk and the last scene which our Animation Programmer, Ivo Zoltan Frey, suggested for the finale. The last scene was just supposed to be a moving still recreation of the original DOOM cover art, but Joon Kim, the animator I gave it to put in that bit at the end as a little surprise.I pretty much came up with and executed each scene except for the two mentioned above and tried to put everyone in the best possible light. Brett: Marty did want to have the special thanks scene with the Doom Marine and Templar Knights for the Zenimax guys that had been supporting us all these years. Alex Brandt wanted me to add a push cart to the IT scene as an inside joke, I stuck some skulls on there for good measure. Otherwise I just tried to match the department with something that worked. You mentioned that homage to the original DOOM box art and title screen. Don Ivan Punchatz’s original art is instantly recognizable to anyone who played games in the early '90s. What can you tell us about recreating this particular moment? Brett: This idea came from Ivo, our Animation Programmer and was posed and animated by Joon Kim. Ivo suggested it as an ending for the entire sequence and I thought that was a great idea. Brett: Of course, I wanted to work on this shot myself, but with so little time and much of the sequence being done on the fly, this was a scene that I knew Joon would do a good job with while I could focus on everything else. Brett: Joon pretty much knocked it out of the park with the posing and camera lead in, and even got the scene ready for in-game placement. He added that little “come to life” moment at the very end and it just worked great. This was definitely a great shot and I couldn’t be happier with the work he did on it. Were there any surprises while working on this sequence? Brett: I was surprised the 3D text out of Maya always looked messed up in-game. For a long time I was a bit worried I was going to have to go in by hand and detach every flat face like in the old days of Lightwave 5.6. Here we are with all this technology and super smart people with no time to focus on something as simple as flat shading. A few people took passes at it, but finally Darin Mcneil, the Lead Tools Programmer, sparked an idea about how we export and it reminded me we had an option buried so deep in our exporter that no one ever used it. Turning that on finally made the text render cleanly. Is there a particular element of this sequence you're most happy with? Brett: That’s a tough question. I spent so much concentrated time on it, it’s probably one of the most ambitious things I have ever attempted. I’d say just the fact that it got done for one, but more importantly that it made everyone feel good about working on this game to see their name as more than just a word amongst a wall of text. As a developer myself, you know the amount of time and effort you put into the game, especially over a number of years. I’m happy that it gave the people that worked on it, as well as the people that played it, a good feeling when they were done. It made everyone feel good about working on this game to see their name as more than just a word amongst a wall of text. Brett: I’m glad that it turned out so close to what I had envisioned, a third-person look back at what you, the player, had done in the game while at the same time having a good tempo and as much movement as possible or appropriate. I’m really happy with the real-time rendering Tiago Sousa and the engine team made and that the team created such great artwork that it was fairly easy to find good scenes to stage the shots in. Brett: There are many that I’ve loved over the years, both in movies and a few in games. There’s so much now that I have a hard time pinpointing one. 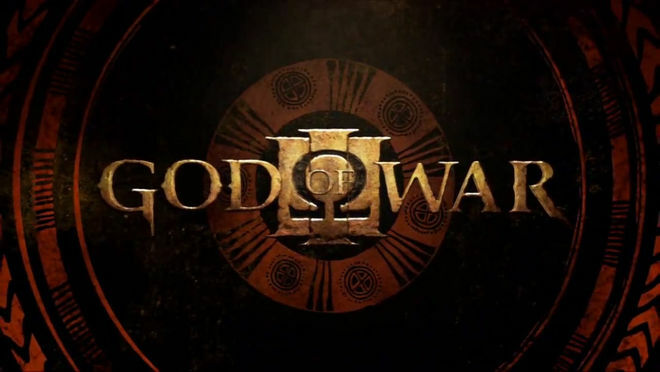 From a game standpoint, God of War III and Call of Duty: Modern Warfare 2 had some sequences that inspired me to dream about us having something as good. Uncharted 4 had a great adventure movie feel to their opening. Those are very tangible ones that stick out in my mind. Brett: Panic Room was also a big inspiration in terms of text in the world. The movie Se7en sticks out as one of the earliest I can remember noticing. The Jackal was also along those lines. Brett: More recently the first Star Trek remake end credits, almost every Marvel movie made in the last ten years. There’s so much good stuff out there that it’s almost overwhelming.